Reaching the unreached is a monumental task. There just aren't enough individuals to get the word out to everyone. TV and radio can be incredibly powerful mediums for communicating the gospel, because they can penetrate areas where Christian workers may not be able to go. Rom. 15:20 It has always been my ambition to preach the gospel where Christ was not known, so that I would not be building on someone else's foundation. Lord, I thank You for all the unique cultures and languages You have created. You know and understand all of them. Thank You that even in places we cannot go, You are there. There is no person that is hidden from Your sight, and no place You cannot reach. 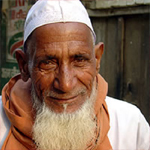 Lord I ask that You would anoint and appoint workers to create relevant, culturally sensitive Christ-centered radio and TV for the Muslim Unreached Peoples of South Asia. Aid them as they research the culture, and give them divine insight and inspiration in their presentation of the Gospel. I ask that You would bless them with brilliantly creative ideas to communicate Your truth, and that the Muslim Unreached Peoples of South Asia would be receptive to Your message. I ask Father that You would give the workers favor with people in the media business, and that You would bless them with all the resources, provision, and volunteers they need. Anoint these media presentations to break through the darkness and shine the light of Your truth to the Muslim Unreached Peoples of South Asia.